Controlling moisture in the crawl space underneath a house is important to prevent structural damage caused by rot and the development of dangerous molds. Proper planning on new home construction or careful analysis on existing homes will prove invaluable. Moisture makes its way into crawl spaces primarily by two means. During heavy rains and melt-offs, the water table can rise higher than the footing. This problem literally leaks from within and can only be prevented with a perforated pipe or french drain positioned lower than the footing. The water can drain away from the crawl space by gravity or it may have to be pumped away if there is not sufficient room to “find daylight”. 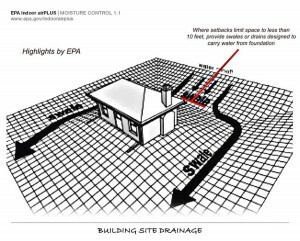 This type of drain is required by the 2012 International Residential Code on virtually all new home construction where the foundation holds back earth in all but desert climates. While this type of drain is more difficult to install on an existing home, it is often the only way to be sure the crawl space will stay dry. On many homes this means doing the excavation manually. This is a great deal of digging with hand tools and much of the soil will also need to be completely taken away to make room for the gravel. Excavation contractors are generally not equipped with the right personnel to handle such projects, so check with your local building contractors. When it rains, the shape and grade of the landscape direct the flow of water. It never needs to be flowing toward the house; always away from or around it. There is no way to prevent the earth from becoming saturated with water, so wherever the foundation holds back earth, it should have an approved waterproofing applied to the outside surface of the blocks from the top of the footing to the finished grade. These flexible sealants provide a higher level of protection against positive pressure from water. Condensation can be a particularly damaging problem if there is not proper ventilation in the crawl space. The 2012 International Building Codes requires one vent within 3′ of each corner. Power vents are an optional replacement for the traditional ones. The code also requires an access of at least 16″ x 24″ when through the perimeter of the foundation, but must be 18″ x 24″ when the access door is in the floor of the house. We recommend using all of the above methods for moisture control in conjunction with each other. A home is a big investment whether it is a new one or not. Water damage from underneath is something that is almost always preventable.